Everything in the box is great quality. No cost has been spared. If you’re unsure what Shadespire is you can find our primer right here. The skinny of it is that it’s a board game that encompasses solid portions of both tabletop miniatures and card deck building whilst taking place on wonderfully produced boards. 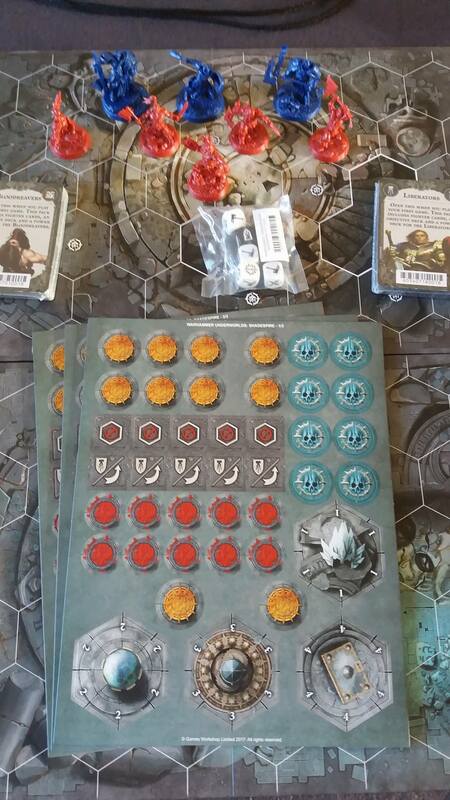 Tokens are used to represent damage, points of victory, etc. Cards are used to exhibit characters in the game as well as powerful abilities and objectives to be complete. One of the refreshing things with Shadespire is that it’s not your Games Workshop’s typical dice-fest of “my little plastic guys shoot at your little plastic guys”. The cards add beyond the simple beat-em-up so it isn’t just a slug fest. Objective cards list conditions that must be met to attain glory points. You amass glory points each time you complete one of these cards and at the end of the third round whoever has the most glory points wins. This is where a few things cross over from typical Warhammer/40K. Objectives can be conditions like “have friendly fighters in the enemy side of the board at the end of the game” or simply “capture objective five on the battlefield”. The key difference is that in traditional Warhammer if you wipe out the other guy’s entire force then that’s it, you win. No two ways about it. But in Shadespire this isn’t the end of the line. These objective cards mean that no matter how badly you’re models are getting pummeled, if you know your deck you still stand a chance. The power cards are also a key part of the game. In one of the sessions I played I had one of my fighters moved onto an objective point I needed for one of my cards. As far as I was concerned this was a done deal. An enemy charged me and failed to land a wound, oh, how I laughed at the futility of his efforts! It was then my opponent flashed the “Confusion” card which had adjacent models of his choosing switch places. I lost that objective and he claimed it for his own objective card which happened to match mine. I was dumbfounded! No matter how well you set up your forces or stack up your guys, these cards can seemingly turn everything on its head. Build your decks and get to know your cards. These things will make or break your game early on! But, of course, what’s the point in having models punch and stab each other if there’s no risk of stumbling failure? This is where Shadespire’s dice system swiftly strolls on it. The dice are six-sided but are unique to the game system and are covered in various symbols. You get a number of attack dice used to roll for attacking as well as some defense dice used for…you guessed it, defense. Some fighters need you to roll the result of a Smash to connect with their target, some combatants require the roll of a Shield to block an incoming attack successfully. The dice system is easy enough to wrap your head around and what is needed is also handily and clearly displayed on each character card. The support system of these dice deserves a mention here, I think. For example, if you have two adjacent friendly fighters and you want them to either destroy an enemy or perhaps one of them is under attack you can use this to your advantage. There are symbols on the dice that, if rolled, count as a success providing the appropriate number of allied fighters are adjacent to the character that is rolling. It’s a nifty little system that doesn’t ensure strength in numbers but simply improves the odds. 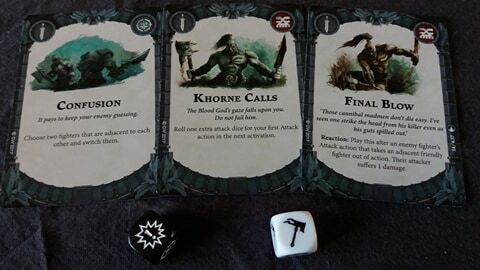 One of Shadespire’s biggest bonuses is that everything you need comes in the core box. You don’t need to dig out an old tape measure or some dusty old 20-sided dice. Everything you need is packed into the box which even comes with some spare resealable baggies to help keep the goods in nice condition. This coupled with the fact that the models need only be clipped off-sprue and pushed together with no glue means you can be playing in no time at all which is something we all want to see more of, I’m sure! The gameplay itself is as it says on the box: fast paced and tactical using as few models as necessary to keep things short, sweet and brutal. It’s something that strikes me as being quick to learn but difficult to master. It might be absolutely ideal for someone’s first venture into card games needing deck-building and would be particularly good for someone new to miniature games. Most importantly, the game itself is some rather pure and undiluted fun. This is not to be mistaken for some cheap spin-off of the Warhammer series, this game system feels just the right level of intuitive and familiar. 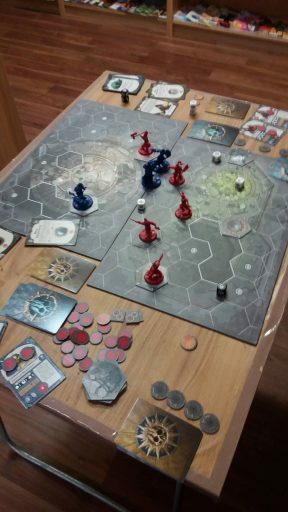 This game took place on a small table, the board itself does not take up a huge amount of space. There seems to be an impending competitive tournament scene for Shadespire as well as more factions on the way. I imagine the game is due to stick around for the long haul. I for one, am quite excited. Bring on the Sepulchral Guard! Thanks for reading. As ever, you can follow us on Facebook for all the latest and if you’d like to support us and our content please pop on over and have a look at our Patreon.